Stouts and dark ales just don’t sit well with me. 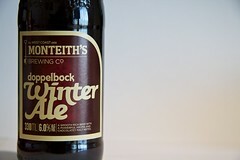 That said, it’s been a long time since I tried either so I thought I’d give a doppelbock a go. Yeah — Nothing changed. The only aroma I get is from malts, not the hallertau hops used in this brew. And a heavily roasted malt tastes. These two things work together to not sit well with my stomach.